This stencil is a Single overlay design. Stencil consists of 1 half of the medallion. Rotate the stencil to complete the design. USPS can deliver most domestic packages within 3-5 business days (often sooner). For international packages, the delivery time is appr. 7-14 days. If you need Expedited shipping, please call us at 201-828-9146 to get rates and delivery time estimates. Any overnight orders must be placed before 12 PM EST. You can return your unused items within 30 days with no restocking fee. Questions? Please see our full Shipping and Returns Policy. We are proud to offer our 18-century French Decor Series Stencils! The Marie-Antoinette Stencil Medallion features classic elegance combined with an amazing level of detail. Pearl beads, acanthus leaves and flowers add a feminine touch to this classic stencil design. You can paint a sky scene in the center opening, or simply leave it as is. This Medallion can be stenciled using a traditional multi-color shading technique. It also looks stunning in iridescent metallics, or simply rolled in 1 bold color for a more contemporary modern look. Cutting Edge Stencils strikes a balance between the elegant sophistication of smaller bridges and the durability of the thicker ones. Always clean your stencils on a sturdy flat surface. The back of a baking tray or sheet pan works perfectly. These fine stencils help you to achieve the hand-painted look in a fraction of the time. We recommend using spray adhesive and blue tape when working with ceiling designs. Blue tapes by itself works too, but gravity always seems to win... We suggest to gently mist your design with spray adhesive, let it dry a minute and you're ready for stenciling. The stencil is made out of durable 12 mil clear plastic stencil material. This material is strong but flexible, reusable and easy to clean. We love it so much more than standard 5-8 mil Mylar! It's not brittle, user friendly and just so easy to work with. In our many years of professional stenciling this material has proven to be far superior than any other stencil material we used. Our customers love it too, and we are sure that you'll notice the difference! Our stencils will last a long time and are a pleasure to use. This awesome tool can save you hours and even days on your next stenciling project. Our decorative painting crew loves it! Have questions about this product or any customer service questions? Share your stencil experience with us. Leave your PRODUCT REVIEW below. If you compare our stencil thickness, size, design quality and prices, you will be amazed at the value that Cutting Edge Stencils offers! Our stencils are expertly designed by decorative painting professionals, so when you're buying a stencil from Cutting Edge it's backed by our 20+ years of painting and decorating experience. Our Sturdy and Reusable stencils can be used again and again. One stencil can produce many images unlike one-time use vinyl decals. Our sturdy clear 12 mil stencil material is user-friendly and easy to clean. Stencils are super economical! Stenciling is more cost effective than wallpaper, decals or faux finishes. 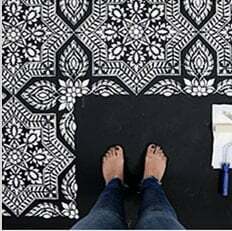 Stencils work on walls, even lightly textured ones, also on floors, ceilings, furniture and fabric You are not limited with your color choices. Choose any paint color you want to perfectly match your decor Stencils will never damage your walls. No peeling, no glue residue, no worries. Unlike decals or wallpaper, stenciling is easy to touch-up, adjust or re-do. With most decals you only get one chance to install it right. With wallpaper, the splitting seams and messy removal together with high cost makes it a less attractive option. We ship our stencils fast using USPS Priority Mail. Our stencil collection is large and constantly growing, so you have plenty of designs to choose from. We offer custom scaling of our designs up or down to accommodate your specific project. Our customer service is the best and the friendliest! We are here for you to answer your questions, to help you place an order, and to solve any possible issues.